I'll be honest, this week I wasn't nearlyyyy as productive, but in my defense, it was a holiday weekend and school started yesterday! Look at these goodies! Now I just have to decide which to use! decisions, decisions..
First up is some "Veranda Sorbet"
I love this line for its bright colors which are so away from my norm I think it would be good for me..
More subdued and my usual color palette..
She included a charm pack of Kate Spain's "Flurry"! Talk about a great surprise. Anyway, moral of the story, I totally recommend Del Ray - and if you check out Bike, Swim, Quilts blog you can get a discount on charm packs for participating in 100 Quilts for Kids! 1. Pay it Forward - I decided to hop on the band wagon. I received my three comments of willing participants, so I'll be working on projects for them, and they in turn will pay it forward to lucky commentors on their blogs! I LOVE that swoon block!! Wow!! I have seen that pattern once before, and just LOVE it!! Great job!! I love your swoon block. Fun fabric! Fun projects! How can you go wrong? oh, I love Swoon! I'll be Swooning again soon! With Terrain in fact! Love that fabric! Your Swoon block looks great! 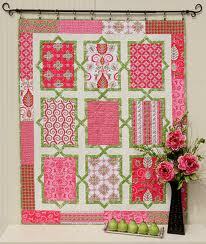 Love your swoon block! Any progress is progress! Your swoon block is great! I really like the pattern you posted a few days ago, so I look forward to seeing more. About Spanish Tiles...I'd go bright. Just one step out of that comfort zone would be a nice adventure, wouldn't it? I love the swoon block. A quilt of these is totally on my list. Fun to see your swoon block (love it!) And I loved the fabric tour--I've ordered from Del Ray before and she was great. Fun blog design you've got there, too. For me, that's half the fun of getting around to all the blogs on WIP Wednesday. Wow you've really got into the WIP thing for a new quilter! I love it, all your projects are looking really great. The swoon block is looking so charming in lilacs, I love it!